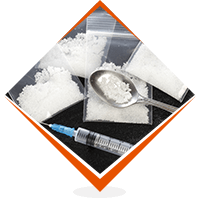 Speed or methamphetamine is one of the most popular recreational drugs out there. In fact, this is very similar to amphetamine but with more intense actions and more severe side effects. Furthermore, it releases dopamine, thus stimulating the central nervous system. Methamphetamine is highly addictive and one of the most abused drugs. As a result, it is classified as a Schedule II controlled substances. It is used mostly in the treatment of obesity and ADHD. Presently, most of the Speed on the street comes from illegal superlabs in Mexico or California. Incidentally, many people who are addicted to speed suffer from some form of mental illness. These can include mood disorders, depression, anxiety, psychosis, and alcoholism. The appearance of speed can change depending on how it is taken. If it is injected it is difficult to distinguish from many other drugs, however, it usually comes in the form of a powder. The powder is usually white or a salmon colored pink and can sometimes look crystalized. The base form and purer type of speed is usually pinker or even grey and feels like putty. By and large, speed can be snorted, smoked, injected, or taken orally. What’s more, the method of intake influences the drug’s effect. If the user injects the drug, the first symptoms start immediately. On the other hand, if the user snorts the drug, its effects appear after a couple of minutes, and if it’s swallowed, the reaction occurs after twenty minutes. After users inject or smoke the drug, they might feel a rush that fades away within a few moments. Paradoxically, if the substance is taken orally, users do not experience the rush. If speed is injected, users run the risk of contracting diseases such as hepatitis or HIV. Furthermore, damage to the veins is common and can cause the development of blood clots. Speed increases the levels of dopamine which stimulates the central nervous system. Dopamine is a neurotransmitter responsible for our good mood and the sensation of happiness. Actually, methamphetamine is more potent than amphetamine, meaning that it can enter a person’s brain more easily. This characteristic is responsible for the euphoric state and the famous rush. Long-term use of speed can lead to severe changes in the brain on the molecular level. According to some studies, the areas of the brain responsible for emotions and memory change structurally due to chronic speed use. Orally taken speed has a half-life of around 4-5 hours, with approximately 62% of the drug being excreted within 24 hours. Speed is one of the more commonly abused drugs, but why is it so popular? Speed’s popularity has grown, especially with the younger generation because of its ability to energize the users and keep them awake. To students it appears as a perfect solution to all their problems, they can party for longer and they can stay awake to study for longer. When it comes to using speed during a night out it is also far cheaper than buying alcohol, although many do choose to mix the two, often with negative consequences. After the initial speed use, many become addicted due to the traits of amphetamine and the other substances mixed in with it, such as caffeine. People may also take speed for their mental health. Speed users are mainly the younger generation that is heavily engaged in nightlife. However, many will rely on speed to prevent anxiety setting in during social situations. In the long term, this tends to have the reverse effect, especially when using highly impure speed. Speed use is very common amongst college students. In fact, over 90% of students who use methamphetamine are binge drinkers. Meanwhile, a report from 1997 states that 2.5% of all Americans had used meth at least once in their life. In the same year, ADAM reported that 40% of San Diego arrested law offenders tested positive for methamphetamine use and in San Jose this percentage went up to 52%. Nowadays, Meth is still a widely used illegal drug which causes thousands of deaths every year. Speed is a Class B drug, meaning it is illegal to have, sell or offer. Furthermore, if speed is prepared so that you can inject it, the drug becomes Class A. Possession of the drug alone can get you up to five years in incarceration and supplying speed to others can carry a sentence of up to fourteen years. Like other drugs in the US, a conviction for speed can carry effects outside your sentence, such as affecting your employability by limiting the type of jobs you are allowed to apply for. The damage that excessive use of speed can cause is irreversible. As a result, psychiatric symptoms can last for years, even after a person has stopped using the drug. These symptoms consist of things like psychotic episodes in which the user suffers from delusions, severe agitation or uncontrollable panic attacks. Speed is one of the least pure drugs around. Due to it being illegal it is only sold on the street, meaning dealers and suppliers have control over its ingredients. Speed tends to be cut with other amphetamines, caffeine, sugars or even paracetamol in order to increase their weight and therefore their value. This means that the drug sold as speed is usually only around 5-15% amphetamine sulfate powder and is therefore even more dangerous. The mixture of speed with other drugs increases the chance of overdose dramatically, due to people not really knowing what is in the drug they are taking. Therefore monitoring the quantity becomes more of a challenge. Sometimes the people in the process of making speed do not even know the contents, due to adding them by mistake during the manufacturing process. Many of the drugs mixed with speed are not only added to increase short-term value but to ensure the user gets addicted, thus increasing long-term profits. For example, caffeine is a highly addictive drug, so mixing it with speed will increase the likelihood of a repeat customer. Taking speed whilst pregnant can be dangerous to both you and your child. Although there is still limited knowledge on the subject it is already clear that it can cause premature delivery, heart and brain issues and disability. There is further research in the early stages currently highlighting that speed use may also affect the social and cognitive skills of your child. Children born to a mother addicted to speed will also experience withdrawal symptoms, which may cause the child to be extremely nauseated, upset or in pain. Furthermore, amphetamines are excreted in human milk, so mothers taking speed should avoid nursing. Speed withdrawal symptoms include both physical and psychological problems. The treatment for speed abuse relies on detox and cognitive-behavioral therapy. Moreover, sometimes during the withdrawal period, medication is necessary to ease the unpleasant symptoms. If this happens, the drug of choice is Bupropion because it helps with depression. The speed addict should conduct the detox in a specialized facility or a hospital supervised by trained medical personnel. They will monitor the patient’s vitals and the process of recovery. In addition, most inpatient rehab clinics provide their patients with 24-hour supervision and medical care while speed removes form the body. After detox, the best treatment option is a combination of counseling, family therapy, cognitive-behavioral therapy, and a 12-step program. Speed is one of the most addictive and most abused recreational drugs. In addition, it is a central nervous system stimulant that increases the levels of dopamine in one’s brain. In many cases, the damage that frequent use of speed can cause is irreparable. Furthermore, psychiatric symptoms can persist for years, even after successful detoxification. According to some studies, it can take more than two years for dopamine to return to its normal level! Finally, the treatments that have been proven to be most effective are ones combining the detox process and cognitive-behavioral therapy.